One of the changes I wanted in the kids bathroom was getting rid of the narrow storage closet that was located in the toilet and bath area. The closet was not wide enough to fit a laundry basket inside and was so deep that you lost stuff in the back. Another issue was the door competed with the entry door and made for a totally awkward, and essentially, useless space. I asked hubby to convert it to open shelving with a cabinet underneath. We removed all the inside shelving, and exterior moulding trim. The depth of the closet was reduced by about 8-10 inches and the height was brought down about 10 inches. We went with a white interior instead of the yellow on the walls to make it look bigger. 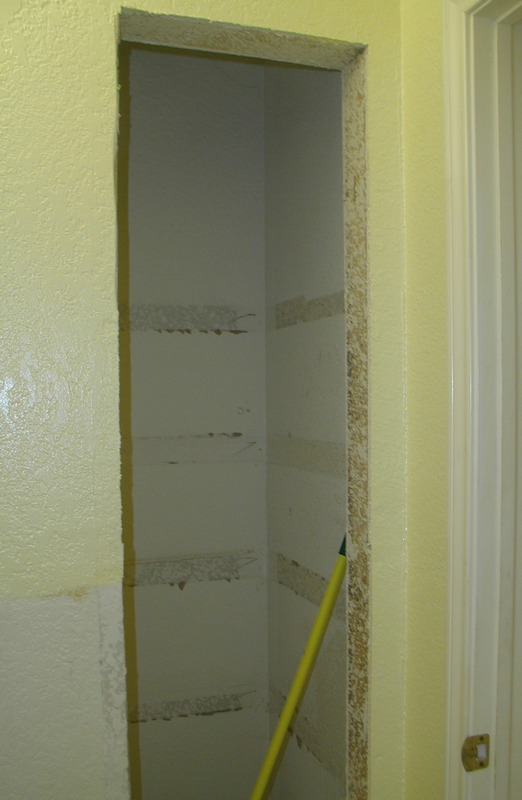 This was done with 2×4’s nailed into the existing wall which were covered with drywall, plaster and paint. I put an unfinished base cabinet from Lowes (a closeout) below which gave me a smaller door with a drawer. It was prepainted before installing to save some time and is the same white as the rest of the moulding. The trim was framed out in the same trim as the wall’s board and batten. We went with a white interior instead of the yellow on the walls to make it look bigger. The speckle gray counter top (Flint Crystal pattern of laminate) was a scrap from our laminate counter installed over the vanity and was installed with laminate glue onto the old shelf which was re-cut. Hubby installed a new outlet inside the closet; electricity was pulled from an outlet in the same wall which opens on the vanity side. This allows me to put in a night light (shade is really a lime green to match towels) so you can use the bathroom without turning all the lights on. Changing the interior size made the space more visually congruent – this size change probably made the biggest difference so take the risk even if you loose a bit of closet space. The brush nickel cup pull, silver and porcelian door pull and silver and porcelian towel holder all coordinate and our continued in the theme of the white and chrome lighting fixtures. 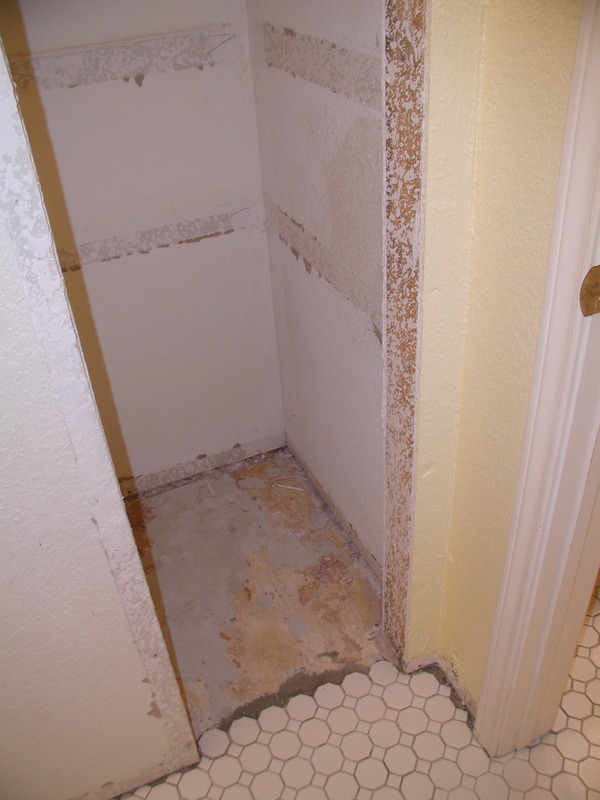 The change makes a big difference and helps the toilet and bath area of the bathroom feel far more open. It will also be far more useful without the possiblity of someone walking into an extra door!